The other household expenses are mixed. 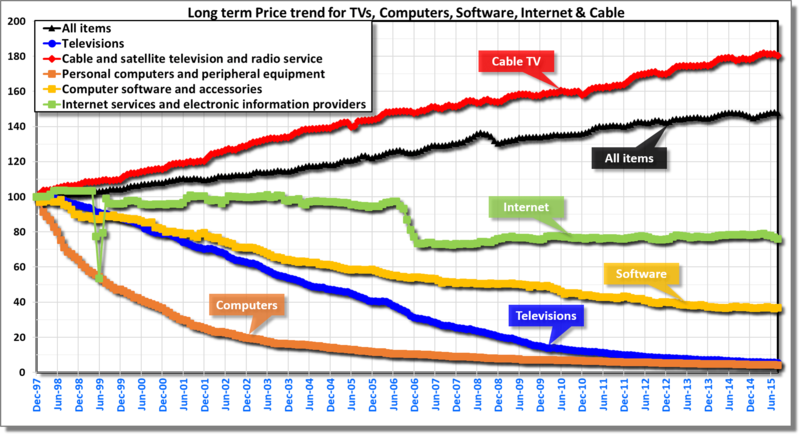 Price trend for TVs, Cable, Computers, Software & Internet (1997-2015). (Click on image to enlarge) Overall prices of goods have increased about 45% in last 20 years, however, the prices for cable TV have gone up by 80%. On the bright side, prices for Personal Computer & Television are down by almost 95%. Similarly, software is cheaper by about 65%. Interestingly, internet prices are almost flat, except a small decline in 2006 when Verizon & AT&T launched the the fiber (source: FCC report on broadband, page 21). Data from US Bureau of Labor Statistics. Got PhD? What it pays during Post-doc?